Appearance: front is mostly white with dark spotty streaks and smaller dark bars on the front, back is a dark brown with white spots, wings and tail have white bars. 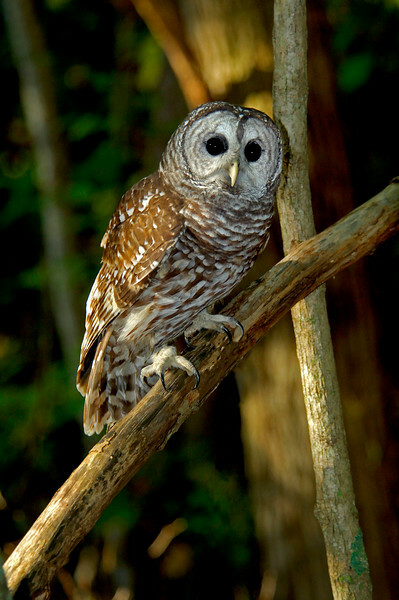 Size: often weighs about a pound and a half, have a wing span of 38 - 44 inches and if you stretched the bird out and measured from the tip of it's beak to the tip of it's tail, the average Barred Owl is just over 24 inches. Food Preferences: loves mice and rats! Also eats squirrels, rabbits, mink, opossum, weasels, bats, doves, small owls, shrews, crows, jays, cardinals and other birds, crayfish, salamanders, frogs, lizards, small snakes, fish such as perch, bluegills, chubs, eels, carp and other slow water fish, box turtles, and insects. Hunting Technique: mostly a perch and glide predator, which means Barred Owls often sit up on a high perch over where they have been able to find prey before (such as a mouse or mole hole, rabbit trail, etc) and watch for something to run by below them. They then jump off the perch to fly down to catch their prey. Sometimes the owl will fly over an area to flush it's prey, then pounces whatever runs out into the open. Breeding & Habitat: Courtship and mating usually begins in late February or early March and on rare occasions may be as late as early April. Monogamous, male feeds incubating female. Lives in wooded areas, often near wetlands or other water sources. Not uncommon to be found in suburbs. Nesting: Cavity nesters, but will use abandoned nests of red shouldered hawks, fox squirrels and crows. Usually, no lining material is added to a nest site. Nests are usually 20 - 50 feet off the ground in pines or other dense conifers, but may also be found in large-limbed oak trees near lakes or ponds. Eggs: white, lays 2 -3 eggs per clutch. Eggs hatch in about 28 days, chicks fledge in 42 days.